New York State is the place to be when the leaves begin to turn! There are so many ways to see great views and to enjoy the beauty of the season. Lake George and the Adirondacks are only a short distance away from Clifton Park, offering even more spectacular leaf peeping opportunities. Planning a trip to the Adirondacks and want to know where to find the best views? 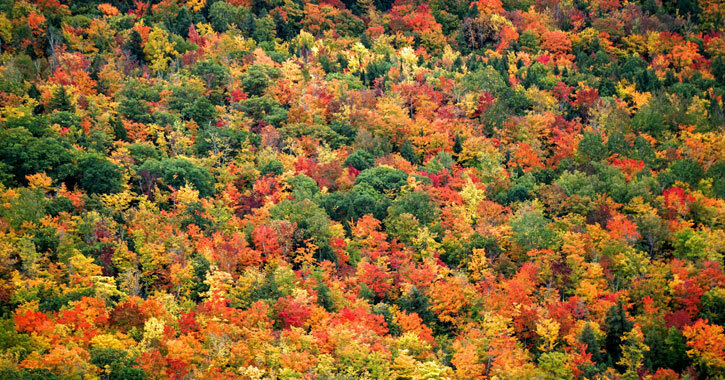 See Carl Heilman's Adirondack Leaf Peeping Guide and Lake George Leaf Peeping Guide. You will see photos of the fall foliage and exactly where the photo was taken. This way you can set out on an adventure of your own. Take a quick trip down to Thacher State Park, located in Voorhesville near Albany. It's a great spot to catch the foliage. Whether you want to relax at a picnic table and enjoy views of the cliffs, or hike along the Indian Ladder Trail, whatever you choose will not disappoint. Thacher State Park's hours of operation are Tuesdays through Sundays, 9am to 5pm, year-round, and the vehicle entrance fee is $6. In Cropseyville (not far from Troy), Grafton Lakes State Park also provides for a spectacular foliage experience. From sitting and gazing at the leaves across the lake, or hiking along one of the trails, there is an option for everyone. The trails at the park range from .5 miles to 3 miles and there are benches along the way to stop, rest, and take in the scenery. Grafton Lakes State Park is open daily from 8am to dusk, year-round. The fee is $6 per car from Labor Day through Columbus Day. Enjoy a short drive north from Clifton Park to Moreau Lake State Park. In addition to being home to a beautiful lake, it also hosts an array of colorful trees during the fall. You can visit Moreau Lake State Park any day of the week from 8am to sunset. For 2018, from September 4th to October 8th, the vehicle entrance fee is $6 per car. In the mood for a day trip? Take a spin up to Lake George and enjoy the views from Prospect Mountain's summit. The view from the top is incredible! Not only will the hike provide an excellent foliage experience, but be sure to take in the scenery on the drive up, too. Not ready to hike? The drive up the Adirondack Northway, along Route 73 through Keene, Keene Valley, and towards Lake Placid is spectacular - and you don't even need to break a sweat! To drive up the cost is $10 per car, and the highway closes on November 11th.